Take a Break and Observe! Have you ever tried to walk somewhere with a two year old? I bet you never realized how many flowers were in bloom or how many little slopes were on the sidewalk until a child stopped to check out each one of them. Young children are constantly observing. The environment is still so new and thrilling to them while we as adults have become habituated in this world and often don’t stop to pay attention to the details. I have been reading “On Intelligence” by John Hawkins, where he spends a lot of time describing how the brain works. The basic premise is that the human brain is a memory-prediction system. The brain stores experiences, relates them to other experiences and uses the memories of all these experiences to make predictions. As we get older, we stop truly observing. Our brain has gotten so competent at predicting that there’s no need to observe every detail. The problem is that being able to observe and make connections that aren’t always predictable is what leads to creativity. 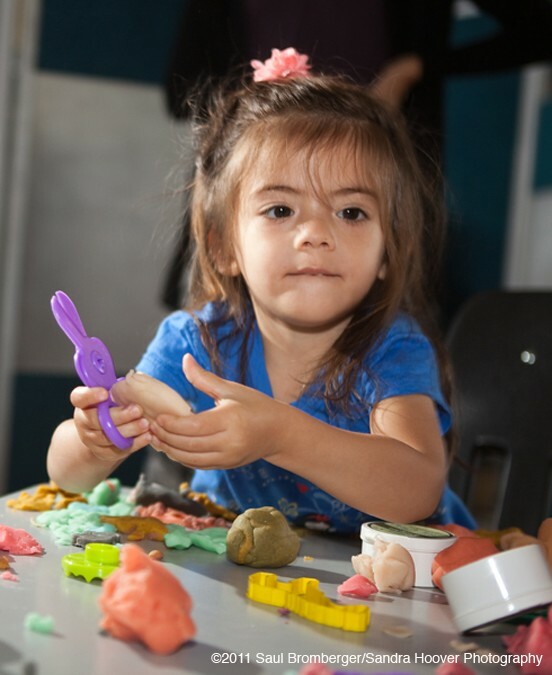 As the famous psychologist Piaget describes, children are natural observers and like little scientists. They make observations, form a hypothesis, test their hypothesis and adapt as necessary. This is how they learn. We’re often in a hurry to get somewhere, but one of the best ways to help children learn is to try to stop rushing and let them observe. 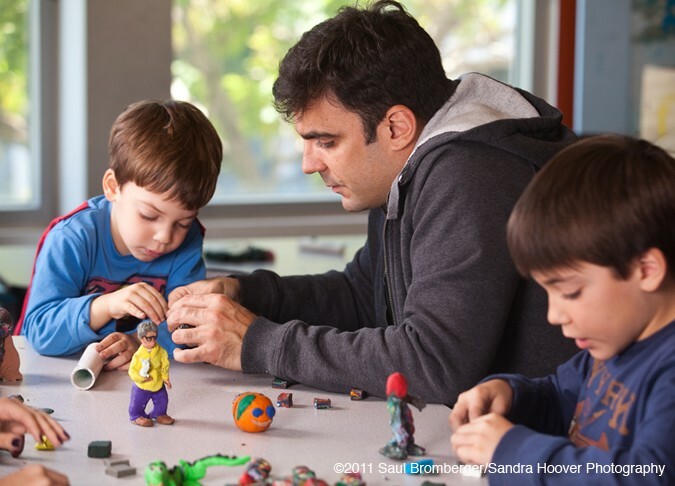 If you can encourage children to continue observing and find the joy in really paying attention, they could become adults who do not only see the current patterns but are also able to create new patterns. 1. Leave twenty minutes earlier so that it’s okay to stop and smell some flowers for a few minutes. Instead of hurrying them along, ask questions such as “Did you notice…” or “I wonder why…”. Make sure not to give the answer away. Children start losing their natural curiosity when we start telling them how things work instead of allowing them to discover things on their own. 2. Get some interesting observation tools in the house such as prisms, magnifying glasses or mirrors. 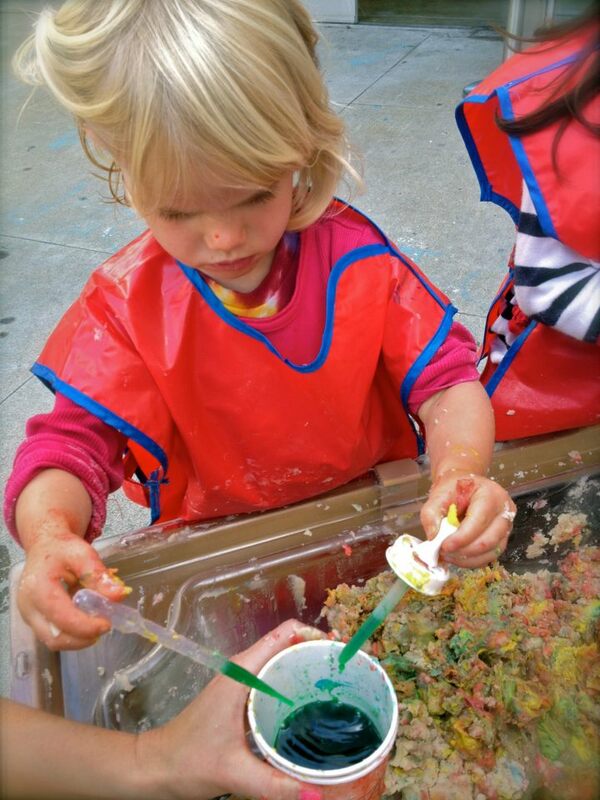 Or, put together a sensory tub or table and let them get messy. Check out one of our visitors participating in our Early Explorations in Science program. What will happen when she adds green? 3. Set up a nature table. When you go for walks, have children collect different items they find. This allows them to really observe nature and become aware of the different seasons of the year. 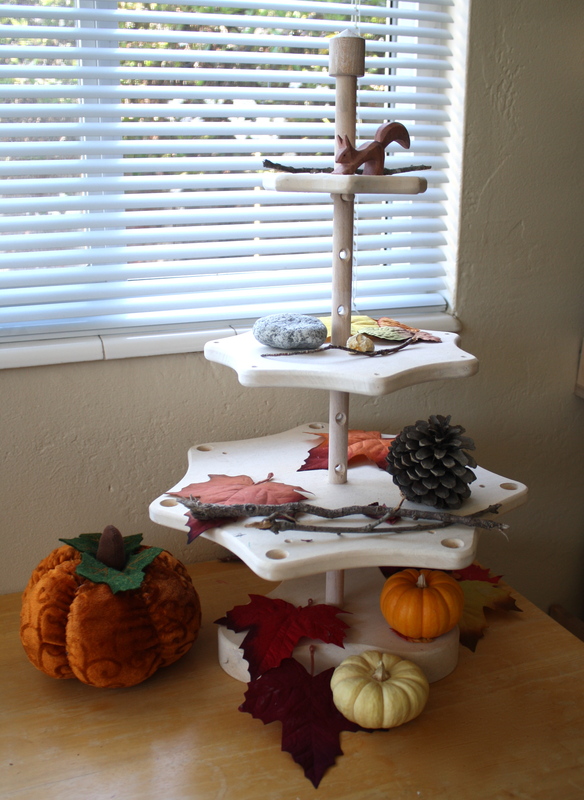 Check out this beautiful table from Buggy and Buddy. 4. Get a sketch book for your child (and for yourself). Next time you’re out for a walk and you see a beautiful plant or an interesting insect, try drawing it. Don’t force it. Children are often just content observing, but once they get a little older, keeping a sketch book is a fun way to document their observations. Keep in mind- It’s good for you too! Take a break from the hustle and bustle of life and just breathe. Let me start off by saying that I have a passion for education, art, and technology that built me into a strong enough candidate to score the opportunity to be an education intern this summer. The museum drew me in with their San Francisco vibe of forming an open creative community for visitors and staff alike. I am a local student majoring in Art History with a specific interest in museum educational programming. I think that technology has a way of engaging visitors on a higher level than normal, even if said visitors aren’t as twitter-savvy as the high school tour group in the next gallery. It is hard to know where to start in educational programming, but the CCM internship program gives us the Intro 101 course. 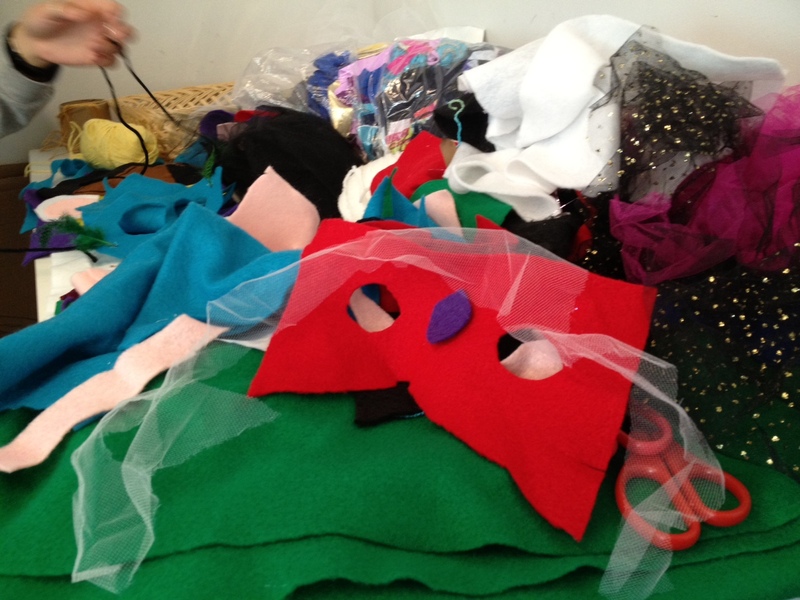 Basically, we are tasked with the duty of creating workshops for visiting groups each week. 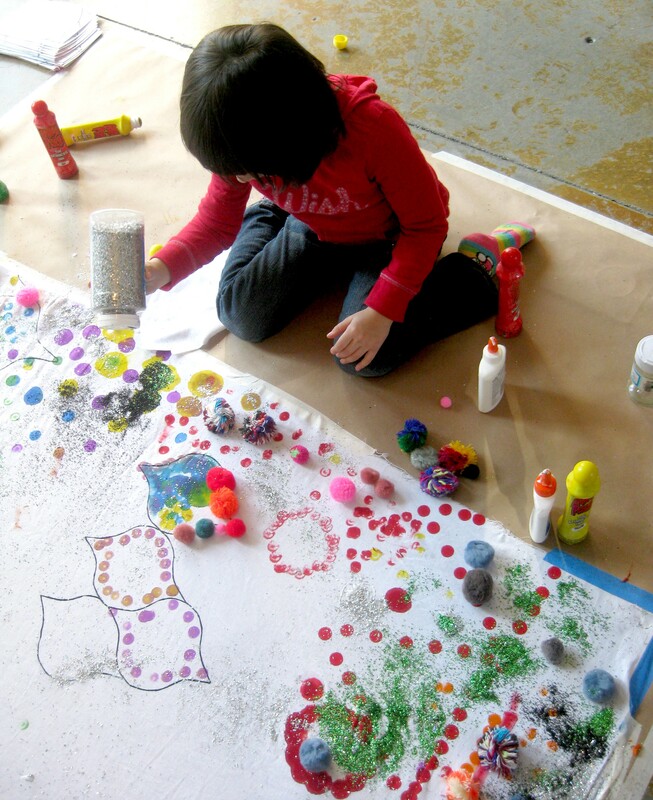 A workshop is normally held in our Birthday Party room and is an activity that can easily be done within 30 minutes by someone five-years-old and under. Give them a coloring book, you say? Sure we could do that. But how is that activity engaging and challenging enough to push their creative ideas into a new realm? See, this is the programming that I vastly underestimated when I took this internship on. I have never had to even think about writing a lesson plan before, especially with material and time limits. It is intimidating to tackle these workshops without any previous experience. I applied here in order to get a better grasp on these issues and I want to share some of the main obstacles we face weekly during workshop planning. One of my favorite workshops (workshop being a group activities station for visiting summer campers 1st grade and under) would have to be the Animal Mix-up. 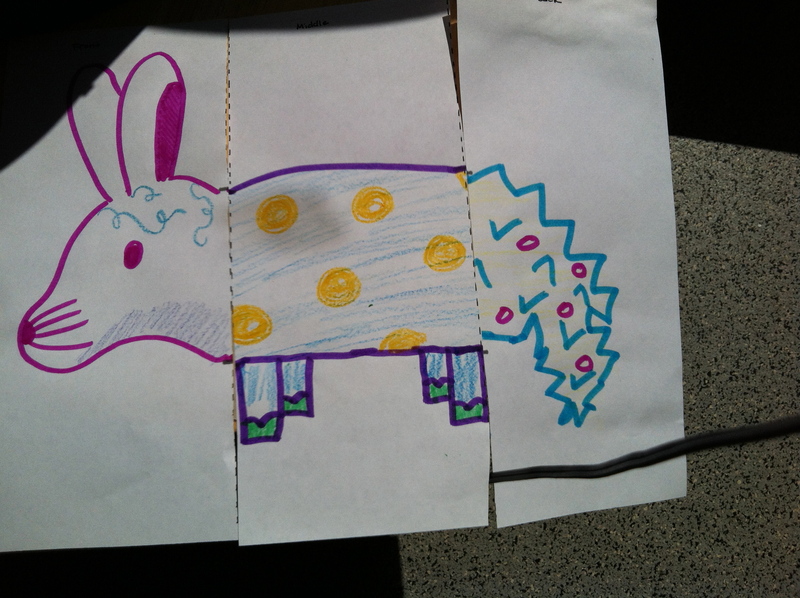 The basic idea is to do a modified Exquisite Corpse by having the kids draw a full animal upon a template, then cut it up into three pieces, and lastly, tape three pieces together to make a new mixed-up animal. 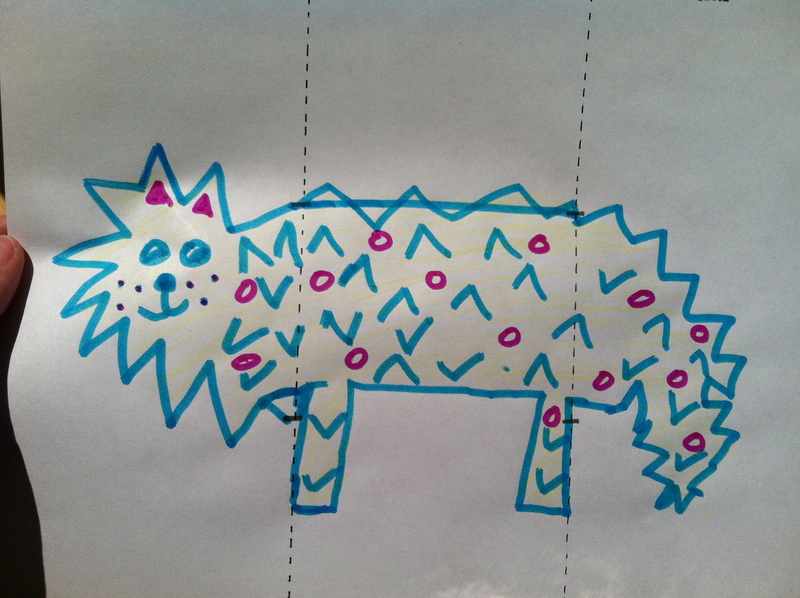 Our goal was to help kids focus on fully creating a single creature and then use the mix-up as a way to physically see the benefits of collaboration (even if the collaboration is not direct). Trouble viewing project through to the end: Many times the visitors would not want to cut their animal up show it to others. They still wanted to make a mixed up creature, but did not enjoy the idea of trusting their group members to provide an awesome animal section. This could be attributed to age, but also has ties to the fact that our workshop has more parameters than normal. Throughout the weeks I’ve learned that the less steps in a workshop, the better. Overwhelmed/Intimidated: We thought that we had planned enough for this problem by doing “ten second animals” three times before introducing the project. Ten second animals is, for example, when you tell them to draw a Buffalo and then they only have ten seconds to achieve a doodle that looks like a Buffalo. It was helpful to show by example rather than sitting around waiting for them to become comfortable with an idea. Comprehension: It wasn’t too complicated of an idea (from our perspective) since the worksheets we handed out had predesignated thirds with guidelines on where to fit your animal. Wrong again! Drawing an animals body to fit certain points was a hard concept to grasp. Overall I learned, the more freedom with a project, the better. Organization from Staff: This one is completely on our side (as were the previous three). We had figured it would be easy to switch the heads, middles, and ends but not when the kids decided to switch all at once! This was more of a “Logistics with Children 101” moment that we learned from each time a new group came in. I realize that some of this blog’s readers are educators and parents, so all of these revelations come to no surprise to you. I, on the other hand, have almost zero experience with educating children and have found each day spent at the CCM as an enormous learning experience. There have been learning moments in educational programming, interacting with visitors, logistics, and professionalism that I would be hard pressed to find in any other type of institution. I almost wish it would be mandatory for business majors to spend a summer doing this kind of work in the same way that I should spend a summer learning accounting as an art history major. I am truly starting to appreciate not only the amount of work that the education staff does every day but also the work of every teacher/professor I’ve had before. Basically, my point is that teaching anyone something takes a lot of effort that goes beyond the specific time you spend with them. As with everything, we get better when we learn from our mistakes and I cannot wait to see how my experience here will shape my projects in the future! The world is awash in sensory stimuli. Something to see and smell, or touch and taste, in every encounter. It can be overwhelming. An example: last Friday, a friend and I walk into a crowded and cramped cafe. The kitchen is open and heat radiates from the broad grills. Music plays loudly, while conversations amplify to compete. We are seated in view of 3 televisions – each broadcasting a different channel. The food is scrumptious, subtle, and ample. The crowd, the heat, the music, the conversation, the televisions, the meal. Sensory saturation! In such situations, focus shifts sporadically, the mind wanders, and conversation is taxing. 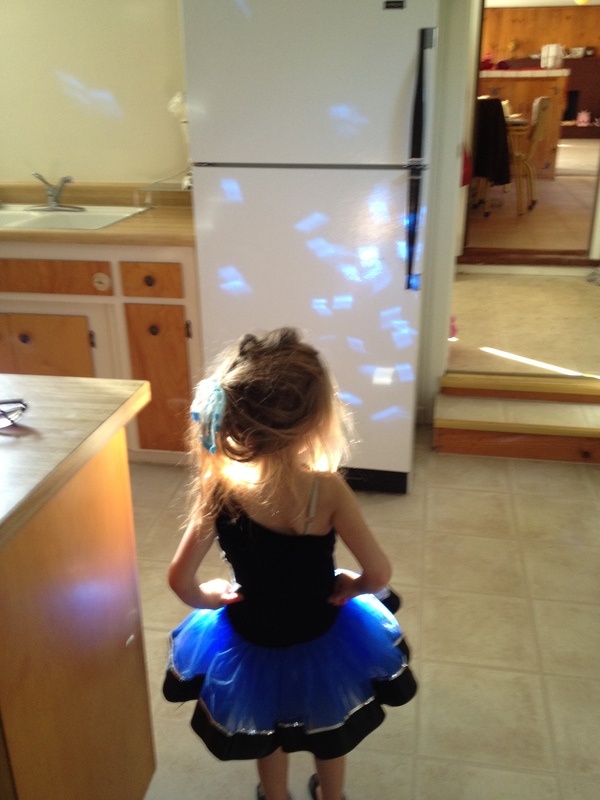 This example begins to illustrate the barrage of sensory input experienced by young children at all times. In other words, young children (roughly birth to age 4) indiscriminately take in whatever sensory stimuli they are exposed to. Imagine being attuned to every sensory input in your environment, no filter. As adults, our brain’s filter is firmly in place, however, here is an interesting sensory exercise to try. Pause during your day and take stock of each of your senses. Notice what your immediate mind has filtered: perhaps the feel of the chair beneath you, or subtler smells, or sounds of cars passing in the background. Now, imagine doing this exercise in the crowded cafe scenario from the previous paragraph. That is akin to the experience of a 2 year old. Through this thick mist of senses we, as parents or educators, sometimes want young children to focus. In fact, we often want young children to focus. We struggle with it, stress about it, and are constantly strategizing. Respecting a young child’s sensory exploration while wishing them to focus on a task – putting on their shoes for example – can be a challenging balance. Keeping this in mind, the rest of this post will discuss CCM tested strategies to gain and maintain the attention of young children in a sensory saturated world. As an educator, I attempt to carefully curate program spaces to mitigate distractions. Reggio Emilia and Montessori education philosophies both stress the importance of a child’s physical environment to encourage learning. Keeping this in mind, program/play spaces can be bright, inviting, and rather austere. There is no need to pack the space with toys, as children need space to move around and the fewer items, the fewer distractions. The immediate sensory input of young children is so engaged that their minds really operate on a “out of sight out of mind” principle. Often grabbing the distracting object and simply sitting on it or putting it on a high shelf will refocus the child’s attention. On countless occasions I’ve wordlessly taken a sharp stick or oozing marker or noisy whistle from a child, stuck it in my shirt, and handed them something else (anything else) in return. Generally the child barely registers the exchange, particularly if they’ve dropped the object before you remove it. The real treat is discovering all these items tucked in my clothing at the end of the day! Repetition is comforting for toddlers and helps them to feel confident and secure. Many early childhood curriculums, including Early Birdles, Music Together, and Mother Goose on the Loose, advocate for about 80% repetition from week to week. 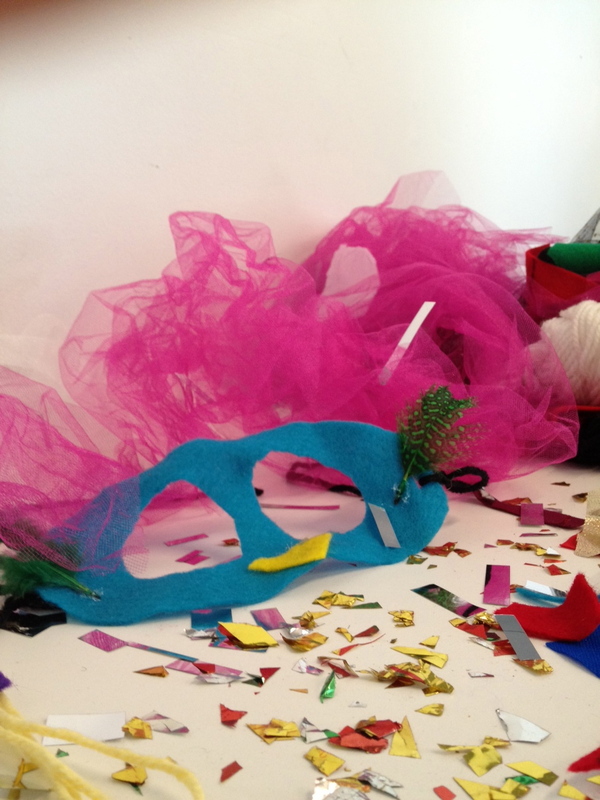 When planning activities for young children I ask: Is this activity age appropriate? Can I reasonably expect a 2 year old to do this? What is my plan if this does not work? What is my second plan? And third plan? As CCM’s Early Childhood Specialist, I use these tools everyday, and everyday I am surprised, foiled, outsmarted, and constantly adopting new strategies. Do you have strategies for holding the attention of young children? Leave a comment! I’d love to give them a try! It should also be noted that this advice is directed primarily at children birth to four years old. Do these strategies work for older children? How might they be adapted for a school aged audience? How is the sensory experience of older children different? What new challenges accompany those differences?